Y'all know that I dig short stories. I've been making a point of seeking out short story collections and adding them to my TBR pile this year, and I just finished an amazing one. 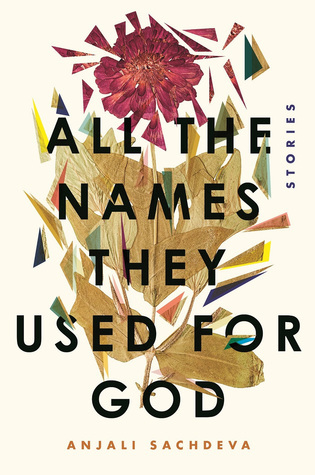 All the Names They Used for God by Anjali Sachdeva is a masterpiece collection. Each story in this delightful collection completely transported me to a new world. It grabbed me from the first story about an albino woman in the pioneer west who discovers a network of caves near her house and explores them while her husband has been gone for months on a trip. Then there's a steel worker injured in a factory accident watching his daughter grow into his supporter and caregiver. There's a fisherman who meets and becomes obsessed with a mermaid and teens abducted by zealot soldiers who will do anything to get away. Each story is its own world and completely immersive. The characters and settings are so strong that I would have read any one of them as a full-length novel, but they're the perfect length for what they are. They left me feeling like I wanted more, but also like I was satisfied. They're sticking around in my head, is what I'm saying. There's a mix of genres here, although each story has at least a touch of the fantastic. There's historical fiction and science fiction here, too, making this a true genre-bender of a collection. There's something for everyone here, tied together by striking imagery and unforgettable characters. I loved this collection. Like, I think I might buy a copy for my personal library, which is a strong statement from a practicing librarian. All the Names They Used for God by Anjali Sachdeva. Adult. Spiegel & Grau (Penguin Random House), 2018. 256 pages. Review copy provided by my local library. Interpreter of Maladies by Jhumpa Lahiri (1999; 198 pages). This is another great short story collection that has stuck with me throughout the years. The Power Naomi Alderman (2017; 386 pages). This novel has similar science fiction elements and strong female protagonists as several of Sachdeva's stories. The Merry Spinster: Tales of Everyday Horror by Mallory Ortberg (2018; 240 pages). I haven't read this one yet and it looks scarier than Sachdeva's stories, but it might make a good choice for fantasy or horror readers dipping their toes into short stories.